Like a lot of Australians, I enjoy a punt or two on sports. I’m not exactly a large punter though with my betting typically confined to the annual Melbourne Cup and the odd game of AFL (Australian Football League). Recently though I thought I’d try my luck at Soccer in the Asian Cup. Sitting down with my wife on the couch before the Grand Final we were discussing the expected results and decided to place 2 x $10 bets on the result (see told you I’m not a big punter!). The results of the game went exactly in line with our bets and after some high fives at the end of the game, we checked our online account only to discover that the bets we thought had won, had actually lost. I’ve included my email below for those of you who like the details but the end result is Sportsbet lost a customer purely based on their poor response to my enquiry. 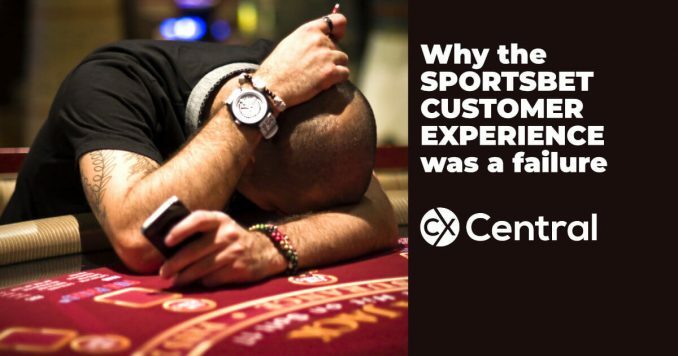 Don’t get me wrong, Sportsbet have done some impressive things (read this article for a great insight into their CX strategy) but all that counts for nothing as I can only rate my personal experience with their brand. And like every other customer out there with any business, they aren’t interested in stats and averages. They will judge you on their own personal experience. So why did the Sportsbet customer experience let me down? If you’ve seen the crazy adds you would know they portray to be a fun, vibrant brand that’s a bit on the edge. The response from the customer service team was cold, impersonal and was not even close to matching the brand persona. I couldn’t work out WHY my bets actually lost. There was nothing in the bet history or transaction that indicated why I didn’t win (nor was there a reference to the relevant T&C’s). If there was I could have easily ‘ self-managed’ and realised why I wasn’t a winner. At least then I would have been an informed loser! I attempted the online chat service immediately after checking my account but was advised I was 25th in the queue. No doubt I wasn’t the only customer who was confused… I waited a few minutes but my position in the queue didn’t change so I figured that by my reckoning it was going to be a long time before I chatted to anyone. I made some effort in writing my email to them and whilst I may not be a comedian, I tried my best to make my email entertaining for the agent that was going to receive it. The response I got back in no way matched my attempted humour and was very ‘fact-based’ to the point of providing extracts of the T&C’s. OK so I’m not a big punter and it was pretty clear they couldn’t have cared less if I stayed or left. When I requested to close my account, again there was no ‘sorry to see you go’ approach, nor any acknowledgement of what lead us to this point – it was simply “we’ve closed your account”. When writing your Terms and Conditions, make sure they are written in a way that actually makes sense to your customers as even when I did get them in front of me I still had no idea. There was no genuine empathy for my situation. I guess they were “sad to advise me my bets were losses” but I wasn’t exactly feeling like they really did care about the situation. A bit more of a long shot here but customising your CRM might have been useful to both of us. It was clear I had never had a bet on Soccer before so a prompt prior to placing a bet with some clear “Did you know?” statements would have gone a long way to avoiding this mess. Give the free money they hand out in their regular promotions to secure new customers, you would think that at a bare minimum the nice thing to do would have been to offer me a refund on my bets? So the lesson is don’t gamble (yes Mum you were right! ), and make sure your customer service experience matches your brand. Cause if you don’t I’ll bet your business will suffer! Update 10 April 2017: I did hear from Luke Rattigan, former COO of Sportsbet not long after my article was published. Luke was thankful for the feedback and provided me with an update on a number of initiatives they were doing to ensure the customer experience was a better one moving forward. You can the article How Sportsbet Customer Service is changing the game – I have to say it’s a great insight and well worth your time reading. To this day though I’ve never heard from anyone at Sportsbet trying to regain my business. And I have to admit, every time I hear an ad for Sportsbet (which is a lot) it still irks me just that little bit!